“If you were waiting for a “black swan event” to come along and devastate the global economy, you don’t have to wait any longer. Currently, the price of U.S. oil is sitting at $45.76 a barrel. It has fallen by more than 60 dollars a barrel since June. There is only one other time in history when we have seen anything like this happen before. That was in 2008, just prior to the worst financial crisis since the Great Depression. 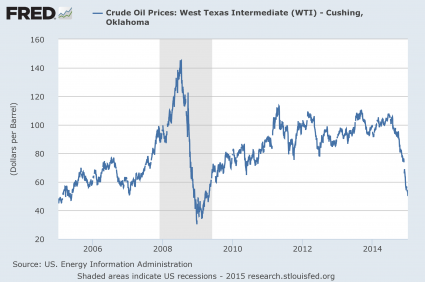 But following the financial crisis of 2008, the price of oil rebounded fairly rapidly. As you will see below, there are very strong reasons to believe that it will not happen this time. And the longer the price of oil stays this low, the worse our problems are going to get. At a price of less than $50 a barrel, it is just a matter of time before we see a huge wave of energy company bankruptcies, massive job losses, a junk bond crash followed by a stock market crash, and a crisis in commodity derivatives unlike anything that we have ever seen before. This entry was posted in news and tagged black swan, central planning, crash, currency wars, Economic Crisis, federal reserve, financial collapse, Financial Crisis, Gold, gold manipulation, market crash, market manipulation, oil collapse, palladium, platinum, PMC Ounce, precious metals, shale oil, silver, US Dollar on January 20, 2015 by Site Admin.